Iceland, with only around one-third the population of San Jose (! ), played Cristiano Ronaldo’s Portugal to a stunning 1:1 draw in the European Championships yesterday. And this wasn’t a one-off fluke. To qualify for Euro 2016, Iceland beat World Cup semifinalists The Netherlands home and away (!) and took the maximum six points from home games against Turkey and the Czech Republic, both strong soccer nations. Iceland pop 0.330 Million. GDP $15 Billion. USA pop 330 Million. GDP $17,000 Billion. And another shocking fact: Iceland only has 20,000 (!) registered soccer players. How many do we have? Around 5 million are registered with U.S. Soccer and around 25 million Americans play soccer. So what might account for this massive, almost unbelievable, overachievement? The Icelandic soccer federation works hard to ensure that practically all coaches have either a UEFA A or B coaching license, the highest coaching qualifications in the world, apart from the UEFA Pro license needed to manage/coach European pro clubs. And this license is used even for teaching kids as young as six. If you don’t teach well from the beginning it is very difficult to teach the fundamentals later and difficult, if not impossible, to build further on a weak foundation. Iceland has around 200 UEFA A-qualified coaches and around 600 B-coaches – one for every ~50 registered kids! And then from age 14 or 15 the top talent is encouraged to move to the continental European youth academies. So it isn’t a lack of athletes or money or facilities that’s keeping us from fulfilling our potential. We have all the resources we need (and more) to become a global soccer powerhouse. First, we need many more qualified coaches that truly understand the game at the deepest level and can teach it. And we need better coaches to teach our youngest kids so they have solid fundamentals in place by the time they turn 10. And we need to teach technical skills, creativity, and soccer IQ. We need ‘complete’ youth players that enjoy the game and are willing to take risks and experiment. Second, we need to discover and then nurture our talented underprivileged and economically disenfranchised youth players. Our expensive pay-to-play model works against finding and developing our best talent. More on this topic in another blog post shortly. Note that youth soccer is free for anyone in Iceland…and Germany, Spain, Portugal, Brazil…the list goes on. Third, we need many more kids to play the game every day during school breaks and after school in neighborhood parks. We can’t expect to have players that can compete with the best in the world when all our younger kids do is go to structured one-hour practices twice or three times a week. There’s more we need to do, no doubt. But these three are obvious to me. Great points, and I agree with them all. However, the ability to remedy them is a very difficult proposition from a society standpoint – ones that I have been trying to understand and fight to overcome for years! (1) Coaching: we actually face a logistical dilemma that Iceland does not – massive numbers. It’s actually easier to get a higher percentage of A and B licensed coaches when your denominator (total population) is only 330,000, than 300,000,000. We also face a styles challenge that Iceland doesn’t: multiple and diverse backgrounds. It’s easier to focus on a single strategy when you all have the same background – we need to overcome that and make that our advantage. A tough task when everyone feels that “their” way is the best. (2) Money: Yes, the pay for play model leaves out a huge number of extremely talented players who never get noticed by the powers that be (en route to State, Regional and National teams). I’m not sure how the foreign clubs pay for all the kids to play (and there are, for certain, fees to be paid: uniforms, coaches, training grounds, equipment, etc). I’m guessing it comes from revenues the clubs make from their regular operations (gate receipts, TV contracts, uniform sales, etc), and I’m guessing those revenue numbers are greater than what MLS clubs make (which is still a minor league sport in the US despite the “success” (aka, participation) at the youth level). Until the MLS clubs start bringing in more money, they may not have it to spend on youth development funding. I agree that whar Iceland has done is tremendous and should be applauded – no question. I just think we have to be careful in evaluating what they did for success can be a feasible model for what can work here in the US. We have many more hurdles to jump over than they do, but if we can find a way to synergies those challenges (make the. Into “opportunities”), then we have a great chance of doing great things!! Very much appreciate your many thoughts, Rob! Fully agree that implementing the needed changes here won’t be easy. Ours is a complex nation along many dimensions. Regarding (1): Agree with you. We won’t get to the same ratio of highly qualified coaches to kids here, mostly because of sheer scale. But we can do much better with the right leadership and a focused effort to revamp our coaching curriculum. For example, U.S. Soccer could offer courses like UEFA A and B in all the major urban areas to make it much easier for coaches to learn. Organizations like NorCal Soccer are organizing their own guest coaching courses on weekends such as the recent La Liga course, so there is an effort to improve coaching, but just not at the scale and commitment needed to make a difference nationally. Getting a UEFA A or B license takes around two years, btw. This needs to be rolled out through U.S. Soccer. Btw, it’s also one of the first things Germany did starting about 20 years ago to revamp their coaching across the country. Regarding (2): Yes, the European clubs make a lot of money, some of which they are required to re-invest in youth development. 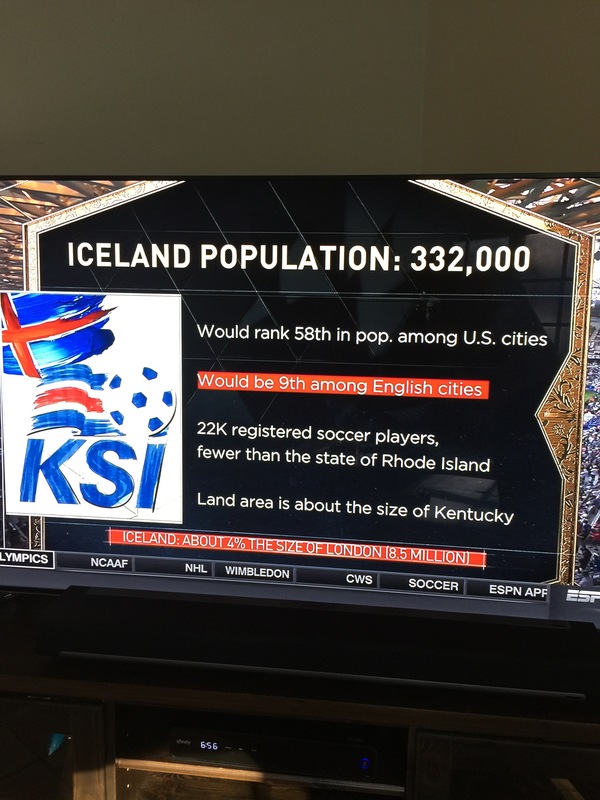 But keep in mind that all youth soccer is free in Iceland (and Germany, Portugal, Spain etc.). Society values soccer so much that government funds (federal, state, and local) are used to develop youth. But it’s much more efficiently invested because it’s about cost control, not maximizing revenue and profits. Also, boys that make an MLS club’s DA team don’t have to pay. But overall, solving this pay-to-play problem is very difficult. Regarding (3): Agree – attitudes have changed and, from a soccer perspective, for the worse. Nobody is out there to play with! And there’s no critical mass of players yet at school. This blog post was meant to highlight an enormous gap between us and Iceland and not necessarily provide solutions or imply that we need to copy what Iceland did. It’s too complex an issue, especially in our country. But I hope we all agree that if tiny Iceland with 20,000 players on a volcanic rock in the middle of nowhere can achieve what they did against all odds, then we should be able to do the same.